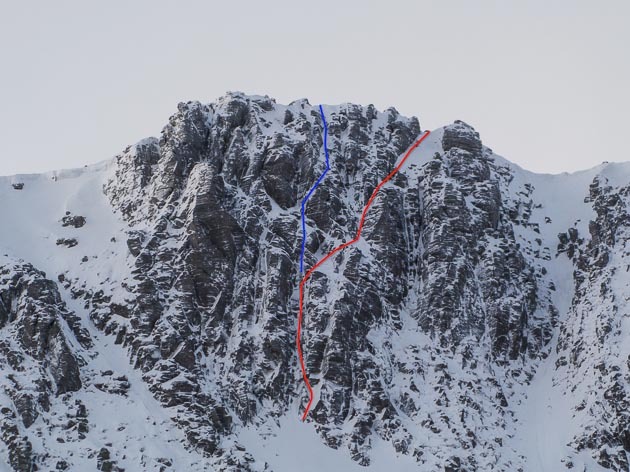 On January 31, Forrest Templeton and Kevin Murphy climbed a possible new Direct Finish to Judas Priest (V,5) on The Cathedral on Lochnagar. “We climbed the first pitch of Judas Priest,” Forrest explained, “but instead of breaking right when it reaches easy ground, we continued directly up an obvious steepish groove parallel to the top of the second pitch of Spellbound onto the terrace that this route crosses to finish up the normal finish of Judas Priest. I belayed at the bottom of a wide slabby chimney corner, which was a full 50m from the bottom. Kev came up but belayed slightly below this on the terrace at the foot of the rib to the right of the big corner and I used the original belay as a runner before climbing up into a hanging groove on the rib with a technical start. The Cathedral is a popular cliff on Lochnagar and its routes see many ascents. There are a number of possible finishes to Spellbound and Judas Priest, as well as the adjacent routes Sepulchre and Trinity, but to my knowledge no alternative finishes have been recorded. Please get in touch or leave a comment if you’ve taken a different exit to any of these routes so the next edition of The Cairngorms guidebook can be fully up to date. This entry was posted in New Routes and tagged Forrest Templeton, Kevin Murphy, Lochnagar. Bookmark the permalink.